Lisa Fimiani became an avid bird-watcher while growing up in Buffalo, New York. In 1986 she moved to Los Angeles, where she joined the Domestic Television Sales division of Paramount Pictures. In her last position at Paramount, she served as Vice President of Sales Administration and Program Lineups, and after 18 years with the company, left to form her own gardening consulting firm. She remembers pulling non-native iceplant in the Ballona Dunes back in the 1980s and witnessed the transformation of that ecosystem through her volunteer efforts, shepherding the return of the endangered El Segundo Blue Butterfly. Ms. Fimiani has been a member of the National Audubon Society since living in Buffalo. In 2006 she stepped down after serving 6 years on the Audubon California Board, and joined the local Board of the Los Angeles Audubon Society chapter as treasurer, serving 10 more years. 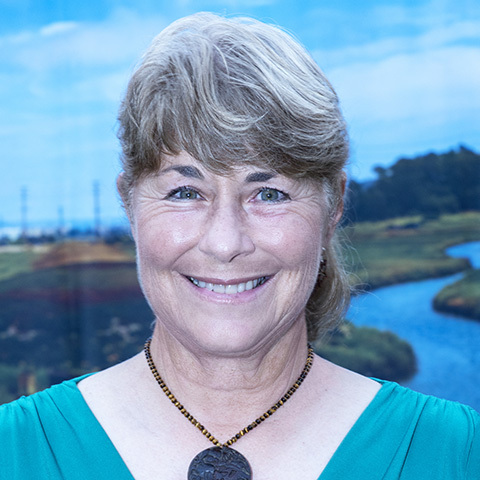 A Docent at the Ballona Freshwater Marsh since it was formed in 2003, Ms. Fimiani joined the Friends’ Board in 2005. She created a native plant design company in 2007. Ms. Fimiani was Executive Director of the Friends from 2009 to 2016, bringing an abundance of knowledge as a local naturalist. Currently, Ms. Fimiani serves as the Dan and Susan Gottlieb Environmental Leader Fellow with Loyola Marymount University's Center for Urban Resilience (CURes), promoting collaborative educational tours and restoration projects with the Friends of Ballona Wetlands, whom she has been involved with for over 30 years. She earned her B.A. in Mass Communications from the State University of New York at Buffalo, and is a locally certified Master Gardener and Restoration Specialist.